60 cans of spray paint + 60 hours of work = 1 intense mural. Aug. 08, 2018, 12:12 p.m. Some of Pittsburgh’s most beloved art doesn’t live in a museum. Instead, it meets people on the streets where they walk, bike, and drive. It’s bold, vibrant and hulking (sometimes figuratively, sometimes literally). You can’t miss Jeremy M. Raymer’s work. His 46 murals span across Pittsburgh’s neighborhoods. And if you haven’t seen them in real life, you’ve probably seen them on Instagram. I’ve been keeping a close eye on the Pittsburgh artist’s work and writing about it often, chronicling his Magneto, Homer Simpson, Hulk, and more. Readers have devoured these stories. I think that’s because there’s something magical about Raymer’s process — how he transforms derelict walls into fine art canvases, molding nothing into something in just a few hours. It’s been a dream of our staff to pull together a mural tour with the artist himself, and we’re happy to present to you Ride with Raymer, a mural tour with The Incline & Healthy Ride. The event includes a guided bike tour with Raymer featuring more than a dozen of his murals, then some time to socialize over food at Talia Cucina & Rosticceria. Bring your own questions for the artist (and your own helmet). 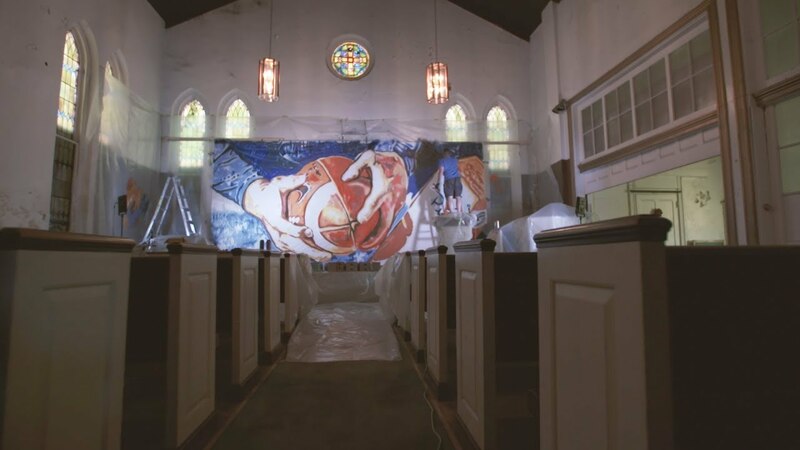 In preparation for the mural tour, we dug through our archives and sat down with Raymer to talk through his murals, his neighborhood, and his other art. Responses have been edited for length and clarity. It all started with a trip in 2013 to Wynwood Walls Garden in Florida, which he calls “the street art capital of the United States.” The visit sparked his passion for a new medium. But he worked as a senior electrical engineer at Westinghouse, so art was just a hobby until May 6, 2016, a date etched in Raymer’s memory. In college at Pitt, he balanced his engineering coursework with studio art electives. During class, a professor told him that he drew like a painter, so he tried a painting class and learned the oil painting skills that would inform his work. Raymer describes his work as “melancholic beauty,” and he’s influenced by the artist Man Ray. Can you pick a favorite mural you’ve created? Magneto’s face, with gritted teeth, covers the wall at AAA Scrap Metals along Penn Avenue near the Lawrenceville-Strip District border, and the comic book character’s outstretched arms reach across the scrap yard’s metal fence as if they’re pulling metal into the building. You can find the Clemente mural on the side of Verdetto’s Bar & Restaurant, 814 Madison Ave. (East Allegheny). What question do people always ask you about your work? Editor’s note: These people are rude. In addition to creating murals, what other art do you do? Sublimation printing for T-shirts, smaller pieces, stickers, and stencil work. In a spot-on portrayal of Homer Simpson, Jeremy Raymer used a shipping container to double as a donut box. It's one of Raymer's many murals in Lawrenceville. Where can people find your murals? What’s your favorite neighborhood in Pittsburgh? Why did you want to be a part of this event? Why should people come to this event?